Back in the day, grooming is almost an exclusive-for-women affair. In fact, we are already used to women spending hours in the bathroom doing their thing – hair rituals, exfoliating, shaving, plucking, and everything in between. Not to mention, that they’ll be spending another couple of hours looking for their outfits and putting on some war paints, we mean make-ups, on their faces. Fast forward to today, men’s grooming is already on a par with the women’s. As you may have noticed different facial products, shampoos, moisturizers and a host of other products for the male species are already thriving in the market. Certainly, these days, men are taking a lot more pride in how they look and carry themselves, and like women, they would want to look and feel great in the eyes of the public. So, if you find yourself searching online about grooming tips for men, don’t worry, you are not alone. We’ve spoken to the team at Venus Barber Shop in Clapham, London and put together this handy cheat sheet to have you looking your best. Whether you’re looking for the right facial care, hair styling, shaving tips, manscaping and more, we’ve got everything covered for you. As more hair products are coming out in the market now, choosing which one is right for you can be confusing. But for the most part, waxes and pomades work best for those with thicker hair and for messy hair styles. For those with thinner hair, opt for lighter hair products and sprays. • Use a mild shampoo which won’t dry out your scalp. Limit use of shampoo to up to three times a week and use hair conditioner daily. – You are not washing your hair often enough which can cause build up of oils and dead skin cells in your scalp leading to dandruff. – You may be sensitive to the hair products or dyes that you are using and your scalp is reacting causing a red, scaly and itchy scalp. – You may be suffering from seborrheic dermatitis marked by oily, scaly and irritated skin. The key to a well coifed and manageable hair is having a regular haircut. 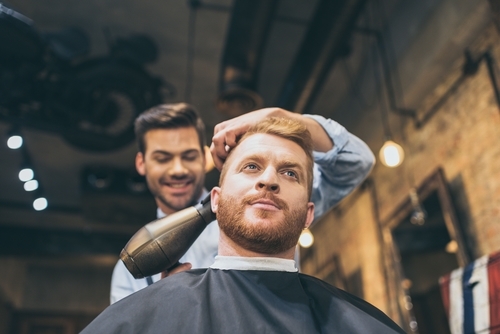 • Opt for a barber, who is more expert in using blades and clippers, instead of a hair stylist. • Tame and maintain your facial hair. • Use a gentle exfoliant or facial scrub to get rid of dead skin to have a smoother face and reduce skin dullness. • Use a quality facial moisturizer. Moisturizers helps to ensure your skin is hydrated and keep your skin looking young and at its finest. • If you have an oily skin, a facial cleanser that contains salicylic acid can do wonders in dealing with a greasy skin. The sun’s UV rays can do damage on your skin which can cause early signs of aging aka wrinkles. • Sort and tidy up those eyebrows. • After showering, be sure to use moisturizer to combat dry skin. Moisturizers can do wonders in your skin from preventing wrinkles from settling in to making your skin soft and supple. • Avoid sun exposure and use sunblocks when you need to. • Don’t forget to exfoliate once or twice a week. Just like your face, your body needs a good exfoliation to rid off dead skin cells for a smoother, softer skin. • Don’t forget to apply a deodorant. • Trim your body hair. • Keep your feet dry by applying foot powder. • Make manicure and pedicure part of your regular affair. Just because you’re a man doesn’t men you’ll simply neglect caring for your fingernails and toenails. Well-groomed nails look good on everyone – men and women alike. You can do a manicure once every two to three weeks while you can have a pedicure at least once a month. • Your hands and feet need some moisturizing too. • Rough soles or heels? Try soaking your feet in warm water for 15 minutes. Use a pumice stone to slough away dry skin from the heel areas. • Keep those pearly white teeth healthy by brushing and flossing regularly. Brush your teeth every after meal and be sure to floss at least once a day. • Visiting your dentist at least twice a year is highly recommended. For a fresher breath and cleaner mouth, use a mouthwash after brushing particularly before bedtime. • Use a good lip balm to keep those lips moisturized. • Use a shaving cream with aloe and glycerin ingredients. These ingredients help minimize shaving-related skin problems such as ingrown hairs, razor burn and irritation. Apply shave oil, gel or cream on your skin prior to shaving to soften your hair and lubricate your skin allowing your razor blade to glide through smoothly. Soak your blades in warm water and use a warm towel or splash your skin with warm water prior to shaving. • To close your pores and minimize potential hair in-growns, splash your skin with cold water after shaving. • To shave or not to shave? The answer is actually up to you. You may consider trimming your hair in the penile area if it’s more comfortable for you. But be sure to use caution and take extra care when manscaping your private area. • If you opt to manscape down there, be sure to use a separate razor designed for that specific area. There are tons of razors and blades available for that specific purpose. • Wash down there with a gentle moisturizing cleanser. • Choose your signature fragrance or scent that suit your personality. • Avoid smoking, it’s bad for your health and it can ruin your skin and may even contribute to hair loss. • Drinking a cup of green tea is known to help combat bad breath, plus, it contains lot of antioxidants your skin will thank you for. • Dress appropriately for every occasion. Above all, make sure your clothes are clean and tidy. • Aside from trimming your eyebrows, trimming your nose hair at least once every week is important.